Gertrude and Heathcliff were indeed sea gulls. He did do a routine about a couple of pigeons who were concerned about their son who was becoming "people toed." I think the most moving memorable and touching part of his program was how he carried on bravely when his son, Richard, died of Lukemia. He never missed a beat. He thanked all the viewers for their kind expressions of sympathy and said, "I guess God wanted to keep Richard a little boy." And who can forget the "Colonel Bogie March" and his portrayal of the old man watching the American flag go by in a parade. I'm proud to have his picture and autograph in my collection. I think Gertrude and Heathcliff were seagulls, but that was a long time ago. My memory's not always so sharp. I think my favorite character was Freddie the Freeloader. I remember Cauliflower McPugg, the fighter with crossed eyes, the Mean Widdle Kid, Clem Kadiddlehopper, and Willy Lump-Lump the drunk. He did a western character with a big moustache, but I don't recall his name. 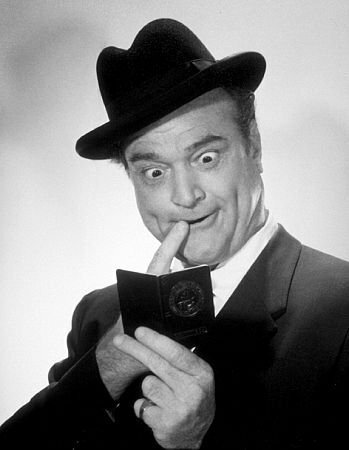 He always made us laugh, and he used a lot of slapstick- who does that anymore? He was a Hoosier, like me. And everytime I hear his famous "Pledge of Allegiance" story, it gives me a warm feeling. You can find it on YouTube. Loved his routine about the two pigeons, Gertrude and Heathcliff. For several years his was the only show on CBS broadcast in color.